Get ready to Jump Around! The Wisconsin Department of Veterans Affairs is pleased to announce that we are giving away free tickets to the Wisconsin Badger Salute to Veterans football game. Join us and watch the Badgers take on the Western Kentucky Hilltoppers on Friday, August 31st at Camp Randall Stadium. 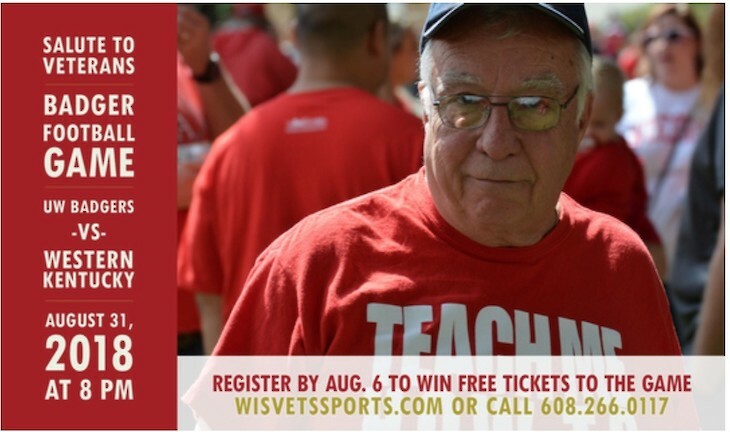 Veterans and service members can register to win up to two tickets online at WisVetsSports.com or by calling 608-266-0117. Also, follow us on Facebook, Twitter, and Instagram for game reminders and updates. RSVP on our Facebook Event page! A huge thank you to the University of Wisconsin Athletic Department for generously providing tickets each year so veterans and their guest can enjoy the game.